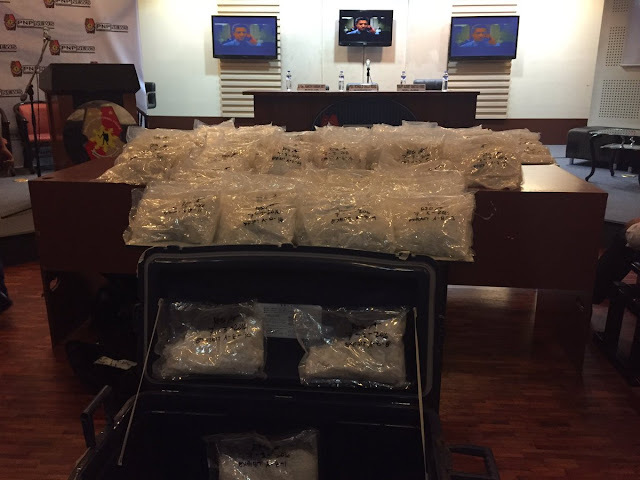 Almost one ton of illegal drugs have been recovered by the Philippine National Police with some already in their inventory since 1977, the PNP Crime Laboratory said Tuesday. "We are accounting our drugs monthly. The volume right now is almost one ton,” PNP Crime Lab Chemistry Division chief Supt. Victor Drapete said at a news conference. “Ang inventory po natin nagstart ng… kasi may na-inventory pa kami na since 1977,” he added. Drapete said the bulk of the illegal substances in storage is shabu with the rest composed of heroine, ephedrine, diazepam, and ecstasy, among others. He added the PNP also has in its evidence room several equipment used to manufacture illegal drugs. He, however, said the PNP has recovered an estimated 10 kilograms in 2013, eight kilograms in 2014, and about 44 kilograms of narcotics in 2015. Asked why the PNP is not disposing the illegal drugs upon recovery, Drapete said the police force is bound to store them despite provisions under Republic Act 9165 or the Comprehensive Dangerous Drugs Act ordering the PNP to dispose them within 72 hours. "Nasa loob ng Republic Act 9165 that in 72 hours dapat i-destroy na. But since kailangan ng court makita 'yung mismong items, hindi nangyayari 'yan. Bagamat may law na ganoon, hindi natin nagagawa," he said. Drapete added the PNP cannot destroy the evidence without a certification. The destruction should also be witnessed by representatives from the Dangerous Drugs Board, Philippine Drug Enforcement Agency, the judiciary, lawyers, and members of the media. PNP spokesperson Sr. Supt. Dionardo Carlos, for his part, said the PNP cannot dispose of the illegal drugs on its own since they rely on the court order. "We rely so much in the order of the court. Hindi puwedeng manira lang ng ebidensiya without orders from the court," Carlos said. Carlos said the almost one ton of illegal drugs are only those recovered during police operations. Drapete, meanwhile, said the PNP Crime Lab can still accommodate another one ton of illegal substances in its evidence room.